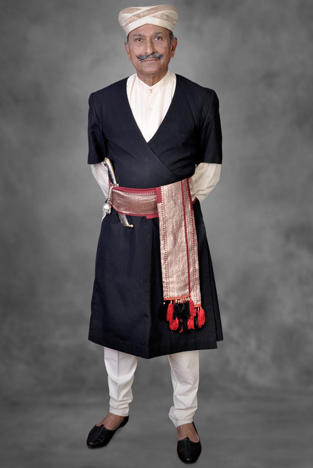 Kupya is a collarless, short-sleeved coat (wrap-around) that reaches below the knees and worn by Kodava men (Coorg men) on formal occasions. It is usually made of black cotton or wool and is secured at the waist by a chele, a red gold-embroidered silk sash. The white coloured kupya is ritually superior to the black one. 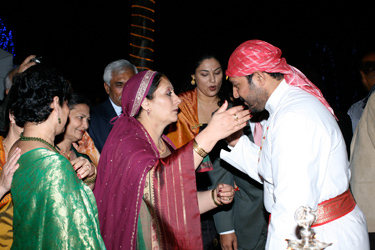 Only a man who is in a position of honour wears a white kupya. During the marriage ceremony the bridegroom always wears a white kupya, with a chele (sash) and a brocaded white turban (pani mande tuni). Unlike the black one, this is long sleeved. In the olden days, a short kupya, reaching above the knees, and a vastra, a short head kerchief was worn. The men's daily headgear consisted of a short head kerchief of a checked pattern. When a Kodava man dies, his body is dressed in a white kupya, which is reversed with the back to the front or with the left end of the gown coming on top of the right end with a white brocaded turban and a red chele with gold coin on his forehead. Red kupyas are worn at the festivals of the Goddess Bhagvati. This is of an entirely different design and fabric. G. Richter, a British historian, has recorded the existence of a blue cotton kupya. The sash was also said to be of either red or blue cotton or silk. The kupya has shrunk drastically in length, to accommodate Western style trousers, chudidars, socks, and shoes. Ties and bows are often worn with a white shirt. These changes started appearing after the advent of the British rule. The dress of men apparently evolved to offer protection from the cold winds and from the frequent rains. It was also functional to climb the hills during work or in the pursuit of game. The chele is of deep red or crimson silk with gold brocade all along its length. It is a beautifully tasseled sash intricately woven with decorative motifs like flowers, peacocks and mangoes. It is 7 to 8 meters long. 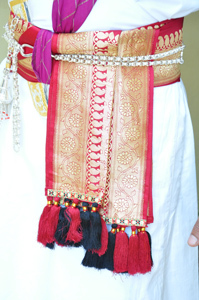 The chele is tied around the waist two or three times depending on the length keeping enough fabric at both ends to form a short loop resembling a bow in the Western attire. The ends of the chele have attractive tassels. Vastra is a red-checkered cloth wound around the head with one corner hanging down to the small of the neck. This headgear was in vogue till recently. Very few old men wear the vastra these days and the men prefer to go bare head. This checkered cloth is available in both silk and cotton. It may vary in colour between various shades of red. The best man at a wedding wears the checkered cloth not on the head but on the shoulder probably to create a separate identity. It is also worn by the bridegroom in a similar fashion. This check vastra is also placed on the lap of the bridegroom during the wedding ceremony. In this case the checked vastra is usually of cotton fabric. In the olden days, a simple white length of cloth, tied around the head was worn as a headdress, or mande tuni as referred to in the Coorg dialect. On ceremonial occasions, this was replaced by a cream and gold mande tuni. This has now given way to “ready made” ones, which are convenient, but lack the grace and character of the hand-tied ones. © coorgjewellery.in. All Rights Reserved.